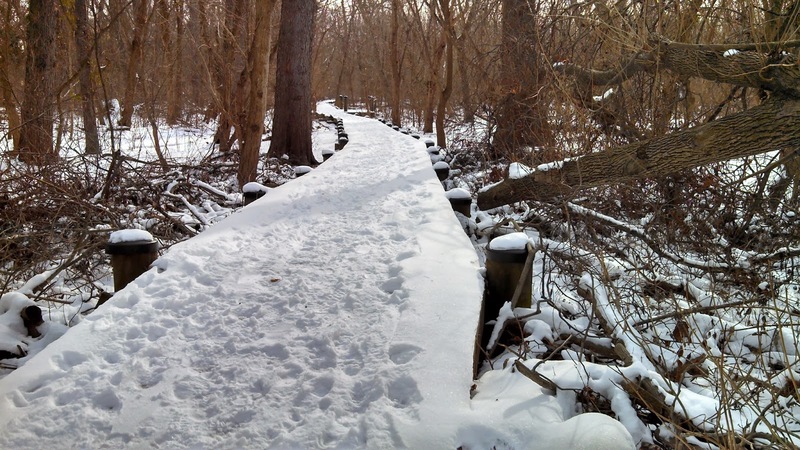 A path on Theodore Roosevelt Island. I took one less traveled. D.C. area residents, like most Americans, work long and hard hours. Living inside the Beltway is expensive. In many families, both parents have to work to pay their mortgages or rent. Then they are stuck juggling their kids' schedules on top of their work schedules. We stress ourselves out in order to sustain our lives, but it is too easy to forget to live our lives. We escape to movies, television, and our wonderful bars and restaurants, but we sometimes miss the beauty that surrounds us within the Beltway. Take a morning or afternoon off for the sole purpose of allowing yourself to escape. Snow has paralyzed the region this week, and today is the first time most people are at work and school. I have been homebound with my two young daughters and am yearning to go outside...alone. 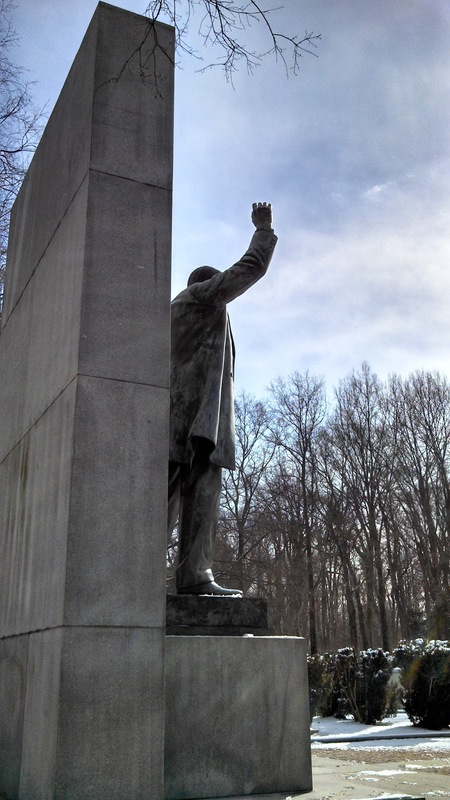 I had not been to Theodore Roosevelt Island in years, so I decided to drive up the George Washington Parkway from Alexandria to experience a little nature. 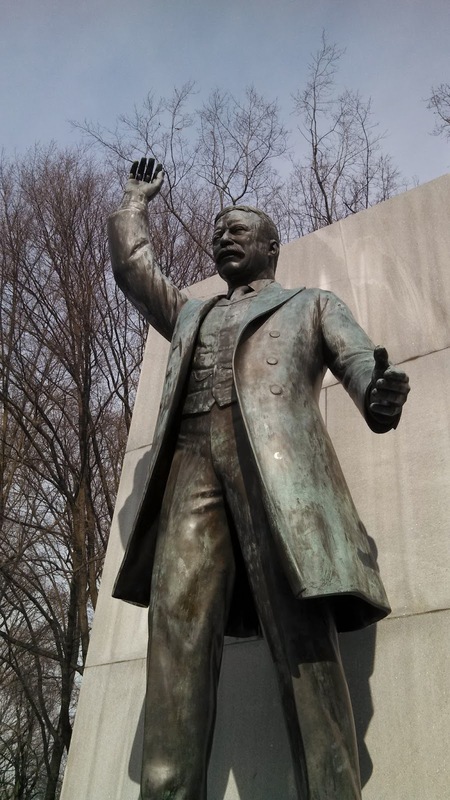 Theodore Roosevelt Island is just south of the Key Bridge on the Virginia side of the river. When driving, it is only accessible from the northbound lanes of the GW Parkway. It is also accessible from a walkway that descends from the Rosslyn side of the Key Bridge. I pull into the parking lot at about 10:00 a.m., and the only other vehicle is a park service pickup truck. I park next to it near the footbridge that leads to the island. As I cross the bridge, the two park service workers pass me. I say, "Good morning," and watch them continue on toward their pickup while I stop to take in the view from the bridge. They are the last people I will see until I return to my car. On the north side of the bridge, a gaggle of geese appears to be frozen into the ice. They honk as if they are sounding horns in distress. I know that they are not stuck, but I wait until few of them stand up and walk about before I can continue on to the island without fearing for their safety. After crossing the bridge, I feel the closest thing to solitude that I have ever felt inside the Beltway. I hear the hum of cars on the parkway, but the geese, perhaps to pay me back for my concern for their safety, conspire to drown out the noise with their continuous honking. The only sound of civilization they cannot subdue is the occasional passenger jet passing overhead on its descent to National Airport. Each step I take cracks the ice and snow underfoot. It sounds as if I am walking on eggshells. The cold air fills my lungs, but a sense of calm fills me. Serenity. I continue along the shore and marvel at the tree branches that have been weighed down into the ice, half submerged in the frozen water. A large rock sticks out from the ice as if it was trapped under the ice and had pushed its way into the air. I lumber on to the north end of the island and find a small, frozen beach with a view of the Key Bridge and Georgetown University. If the ice were thicker, I would be able to walk across the river to touch the bridge. I continue on into the frozen silence and forget about everything. I imagine the trees as people. The tallest, straightest trees with their branches jutting out at perfect angles are the CEOs, Army generals, and corporate law firm partners of the tree world. They reach so high that they appear to nearly touch the sun. They are majestic for the heights they have achieved. Then I look around and notice the smaller, crooked trees, the ones that had to twist and turn in their struggle to find sunlight under the shadows of the giants. They are the artists, the musicians, the writers, or are they the kid who was dealt a bad hand and made the most of it. These trees went against convention and created their own paths. And they survived. I remember civilization when I find myself looking across at the Whitehurst Freeway. Traffic ensnarls the cars. Their trapped drivers are probably urging the traffic to move so they continue on towards their destinations. The Washington Harbour rises above the ice. Its blue-tinted windows make it look like a futuristic ice fortress from a science fiction movie. I come to the long wooden boardwalk that passes over a frozen swamp. The swamp is full of sprawling green life in the warmer months, but the only signs of life now are the squirrels scrambling on the branches above and the birds chirping in the trees. As I walk along the boardwalk, I am tempted to take my boots off and walk barefoot in the snow for a few steps, something I had not tried since I was a teenager. I realize I am far from the car and have nothing to dry my feet. I give in to reason and decide to keep my boots on rather than risk frostbite. In the middle of the long boardwalk, a walkway extends into a large pond in the middle of the island. The cross-country ski tracks that I have been following along the boardwalk veer onto the walkway. I follow the ski tracks along the walkway to the middle of the pond. The pond's frozen water is a dusty green. 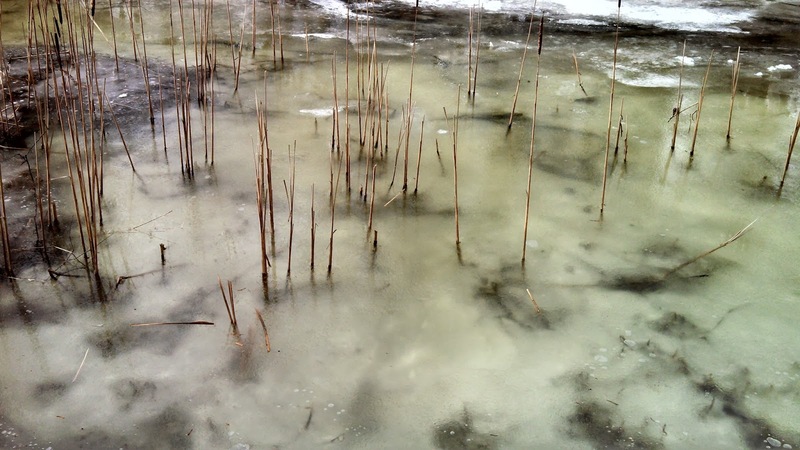 Reeds protrude from the water and plastic water bottles are suspended in the ice. I hear an occasional crackling sound. I cannot tell if it is ice cracking under the sun's limited heat, branches cracking under the weight of the snow, or animals disturbing the silence, but I decide to return to the main boardwalk...no longer sure if I am alone. The gaps between the barren trees give me a view of the Washington Monument and Kennedy Center rising up from the wilderness that I have not seen before. I wander on until I reach the southern end of the island, where the Theodore Roosevelt Bridge carries the speeding traffic of I-66 above my head. After rounding the southern tip of the island, I begin my walk back to the footbridge to the mainland. Before I reach the bridge, I spot Theodore Roosevelt's Memorial Plaza through the trees. I follow the path towards the center of the island where the plaza sits. The snow-covered ground and leafless trees give me the feeling that I have discovered a long-forgotten monument. Having not seen another human being for more than an hour, I enjoy this moment alone with President Roosevelt, and his words etched in four giant granite tablets titled, "Youth," "Manhood," "Nature," and "The State." Alone, I am able to stare at the details of his statute, the wrinkles and what appear to be scars on his face and the wrinkles on his coat and pants. After walking around his statute and viewing it from every angle, I walk back towards the footbridge and the warmth of my car. I am relieved to see the geese have flown off. Theodore Roosevelt was a conservationist and outdoorsman who understood the value of time spent in the outdoors. After a trip through this small piece of wilderness surrounded by the stresses and demands of society, I realized how wise Theodore Roosevelt was. I look forward to my next trip to Theodore Roosevelt Island, but I know it is unlikely that I will find this much solitude again unless I return on a cold winter weekday. I hope I have that opportunity. And the next time...the boots are coming off.